This article is 2468 days old. 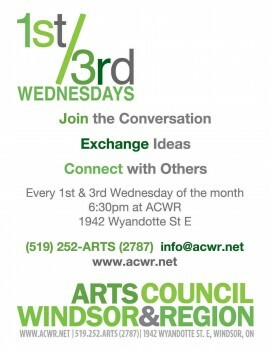 1st/3rd Wednesdays is a series put on by the Arts Council Windsor Region in hopes of creating a collaborative visual story of the Arts in Windsor Essex. The next meeting takes place this Wednesday starting at 6pm at the Arts Council offices located at 1952 Wyandotte Street East in Olde Walkerville. The Acting Block Presents a Youth Theatre Showcase at the Arts Council Windsor and RegionEnjoy a presentation celebrating youth theatre and interactive activities offering a taste of fine arts summer camp. The open house style evening will include interactive activities including improvisational drama games. Staff will be available to answer questions about summer programming as well as classes and productions offered in our upcoming Fall season.